The advent of space-based observatories has resulted in a rapid expansion of the range of wavelengths that astronomers can now use to study the Universe. Included amongst these is infrared (IR) astronomy, which is providing powerful new tools for investigating a wide range of astronomical problems, from the origin of the galaxies to the origin of planets and, perhaps, life itself. Much of the IR radiation from space is absorbed by the Earth's damp atmosphere, but from telescopes in orbit the full range of wavelengths can be observed. In particular, IR radiation can allow us to look back into the furthest reaches of the Universe, to distances and times so great that the light from these objects has been stretched into the IR region of the spectrum. Similarly, because IR radiation can penetrate the great clouds of gas and dust within the galaxy that block the view in the visual part of the spectrum, we can study the processes involved in the formation of stars and even planets. In fact it was the discovery by one spacecraft, IRAS, of the so called IR 'excess' that revealed a disc of dust around the star Vega, a possible precursor to planet formation. Because IR radiation is a measure of heat content, it allows astronomers to detect objects that are too cool to glow in optical wavelengths but are visible in the IR, a possible tool for tracking down some of the elusive dark matter required by cosmologists. In May 2009, the European Space Agency launched its most sophisticated and powerful space telescope to date. Originally called FIRST but renamed after the famous English astronomer, William Herschel, the discoverer of infrared radiation, the HERSCHEL observatory builds on ESA's previous successes in space-based IR astronomy. 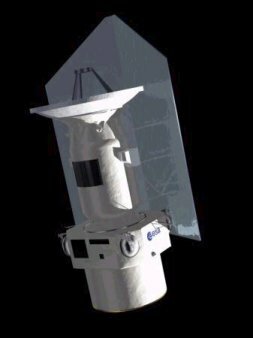 In 1983 the US-Dutch-UK built IRAS (Infra Red Astronomical Satellite), which revolutionised IR astronomy by mapping over 250,000 IR sources as well as broad areas of IR emission. This success was followed up in 1995 by ESA's ISO (Infrared Space Observatory) satellite which operated for nearly 3 years. The data from both these missions are still being analysed today. The experience gained in developing these missions has encouraged ESA to go further in pushing back the boundaries of space based IR astronomy with the HERSCHEL observatory. It was selected as one of the Cornerstone Missions of ESA's Horizons 2000 programme and is one of the largest and most ambitious flights launched by ESA to date. At 7.5 metres tall and 4 by 4 metres across, the 3,400 kg satellite carries three main instruments, a high resolution spectrograph (HIFI), an infrared camera and spectrograph (PACS) and another different type of camera and spectrometer (SPIRE). These instruments will analyse the 60 to 670 micron IR waveband collected by the Ritchey-Chretien design telescope, the heart of which comprises a 3.5 metre mirror, which is four times bigger than any previous IR space telescope. These detectors will also be cooled down to minus 271°C, just 3 degrees above absolute zero, using a cryostat full of liquid helium. This is to ensure that the heat emitted by the spacecraft itself does not affect the observations being made. To protect the satellite from the heat of the Sun, the telescope is also covered on one side by a full length sunshield. HERSCHEL was launched on an Ariane 5 rocket and took up its observing position at the Earth - Sun L2 point, 1.5 million kilometres out from the Earth, away from the Sun. This position reduces the amount of IR interference from the Earth and gives HERSCHEL its widest field of view. The mission has been successfully operating since 2009 and is slated to run through 2012. HERSCHEL, like its predecessors, has opened up a new window into the darkest and coolest corners of the Universe.